Well I am back from Oakwell Hall and it was a great success. I have spent all day sitting in the lovely barn with lots of other crafty people, I have finished hand quilting my Xmas hanging while talking to lots of lovely people and selling my stuff. So all in all a great day. 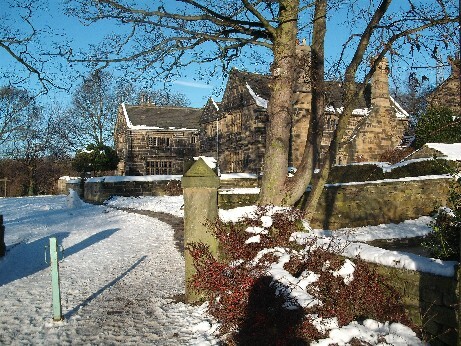 The hall looked beautiful this morning in the winter sun. We were in the barn which is used for wedding receptions – my first customer was one of the bridal party (don’t know if she was actually the bride) who bought two baubles. In terms of what sold it was very interesting as I only sold one complete tree. Lots of people admired them and took the tree part off to look underneath which I think confused them as a couple asked if it was for a candle (which you could do after but not while the tree is on the top!). I think next time I make them I will try to use twigs in a piece of sawn off log so they look more tree like. 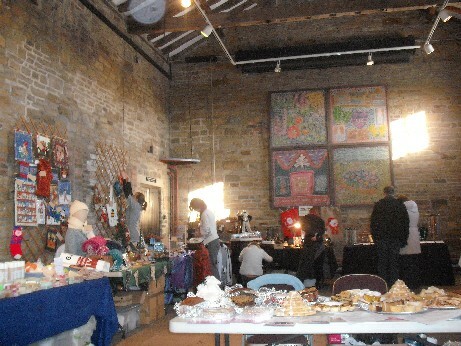 The barn with the yummy cake stall behind me! It could have been the price, it is always difficult to know what the charge for hand- made goods as I had to factor in the cost of the pot, charm, fabric and time so I priced them at £4. Maybe that was a bit high, I could have reduced them but I wasn’t that worried about selling any more of them as I need lots to give to people this year as their Xmas card and if I’d sold all of these I would just have to make more. 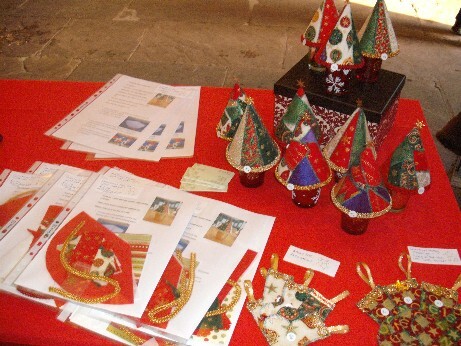 I did sell quite a few kits, all but one of the stockings – could have sold more of the little ones as 5 went in one go, half the gift bags and about half the baubles and pine cones so another donation will be going to Community Action Nepal. It was a very good experience seeing how people react and what else people are selling at events like this. 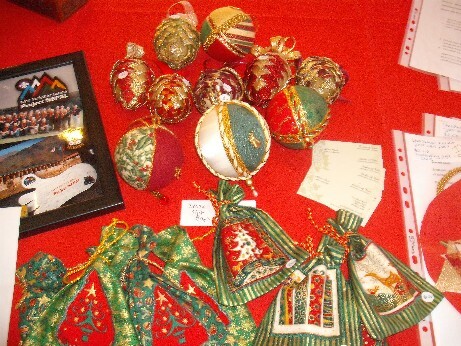 There was only one other person selling ornaments and she didn’t sell that much of her stock , she had lots of lovely padded ornies and hangings. 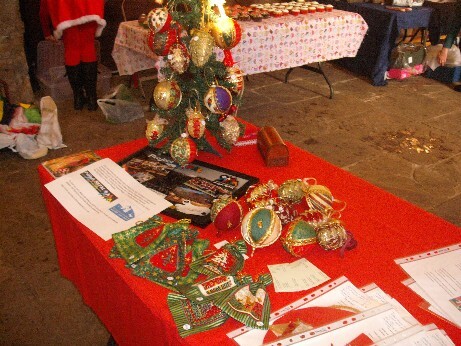 There were two fab cake stalls there, one selling Xmas cup cakes and the other more traditional mince pies and Xmas cakes and lots of jewllery/ handbag and gift stalls. The baubles and cones on my mini tree - the lady in the Santa oufit was the one with the cup cakes! For a copy of the instructions to make the tree please click on the link below, this will open up as a printable Word file with colour pics. Thanks for visiting and don’t forget to comment on my blogaversary post to enter the giveaway – I will be picking a winner next Thurs the 9th.